On a clear day, you can see the coast! Unmatched Views! 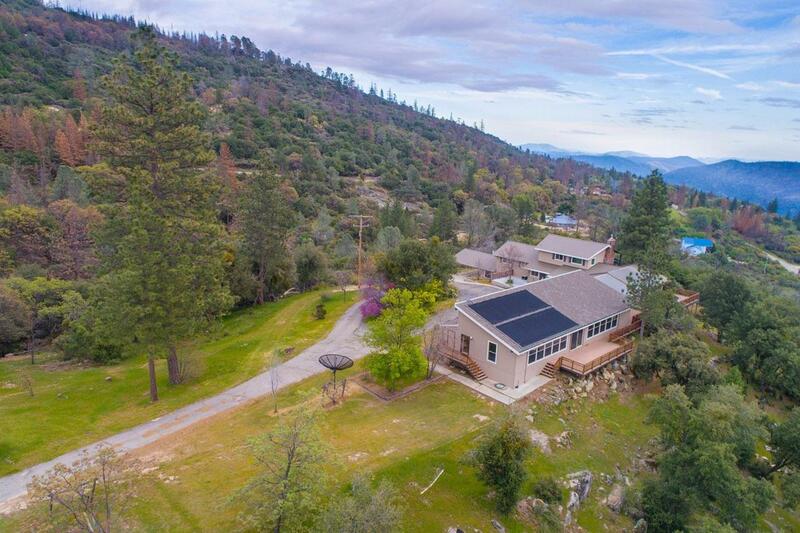 This custom built home is on 23+ acres perched on the Ridge just below Meadow Lakes. Only 35 minutes to River Park or Old Town Clovis. Big island kitchen, pool room joins the master suite. A large sun room, upstairs a game room boast a handmade wooden slab at the wet bar, with a fireplace. Newer composite decks are maintenance free! INDOOR Solar POOL, off master is handicap accessible. Pool, spa and Sauna housed in a windowed, vaulted, spectacular knotty pine tongue and groove room. You see the city lights at night and beautiful scenery from Table Mountain to the Coast Ranges from this property! Decking is all the way around. Providing unmatched vistas, and cool canyon breezes. Driving in there's a very private entry with a circle drive; bordered by a giant boulder, oak trees, mature landscaping, a carport, a large workshop, and the basement doubles as a vintage wine cellar. Newer vinyl windows. Only minutes from Shaver Lake.